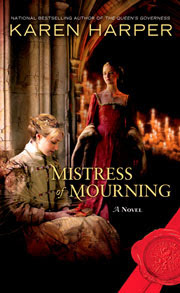 One-sentence summary: Two grieving mothers -- Varina, a candle maker; and Elizabeth of York, Queen of England -- come together when an unexpected royal death exposes sedition, conspiracies, and more deaths. Do I like the cover? : I don't hate it -- it's lovely seeing the two full figures of the women but I don't think either figure captures the two female leads. First line: "Just think on it -- us making candles for the royal wedding," my brother-in-law, Gil, called to me from the door of the wax workshop. Buy, Borrow, or Avoid? : Borrow or buy, especially if you like easy-to-inhale historical fiction with a unique angle and a lovely heroine. Why did I get this book? : The heroine having a candle-making business was so interesting I broke my Tudor ban -- and I'm so glad I did! Review: Set squarely in the world of 16th century merchants, our heroine, Varina Westcott, is a young widow with a thriving candle-making business. Mourning the loss of her infant son, Varina devotes her time to making beautiful, lifelike angel candles which are sold illicitly as she isn’t a member of the city’s powerful candle-making guild. As if fending off her predatory suitor isn't challenge enough, she accepts a mysterious commission from the royal palace, which, unsurprisingly, has an enormous impact on her life. Her client is none other than Queen Elizabeth of York, the wife of Henry VII. Still grieving the untimely deaths of her brothers -- the infamous princes in the Tower -- as well as her two infant children, Elizabeth finds in Varina a kindred spirit. But Varina’s seemingly simple commission -- to design wax effigies of Elizabeth's dead kin -- transforms into a more challenging job when Varina is asked to investigate the sudden and mysterious death of Prince Arthur (as in big brother of Henry VIII). There's a predictable romance that I rather liked with a male love interest who was, I'll admit, kind of dreamy. I can't speak to the novel's historical accuracy. Harper's conjecture about who murdered the princes in the Tower and the cause of Arthur's death might not resonate with those who are armchair historians of that era, but since I don't know, I didn't care, and I liked the mix of history, romance, and intrigue. Ultimately, this is the best kind of summer historical fiction: light but not insultingly so, with an obvious romance to counter the dark conspiracy. Tudor fans might enjoy this with it's early Tudor roots; those who like artisans and women-who-do-unusual-jobs will find Harper's candle-making research fascinating. I would be drawn in by her candle-making business too. Sounds good! Diana -- it was such a fascinating set up -- really unique and interesting! I loved this book, too! I was already a huge fan of Karen Harper and this book didn't disappoint. This was my first Harper novel -- I'm a total fan now! I loved this one. A "loved" rating for a Tudor historical fiction novel? I know you are often tired of this often-written about royal family, so that carries a lot of weight! Dual narratives can be tricky for me as a reader, too, so I am glad this one was handled so well. Elizabeth of York is one of my favorite historical figures, so I will DEFINITELY have to check this one out. Great review, Audra, and I am glad you enjoyed it so much! Jessie -- I'm adding this to the small pile of books I'm going to send you -- I'd love to get your thoughts on this one. It was so unlike the usual Tudor fic that it totally won me over -- just loved the unusual angle for our heroine and the use of the less-heard-of Tudors! I'm a Tudor freak :p but usually like historical fiction with a little more depth, but you've intrigued me. And, of course, Jessie has made me want to go dig up everything I can find on Elizabeth of York :/ I should've been a history major. Oy. I'm going to have to give this one a try. I've never read any of Harper's novels, but it seems a great one to start with. As always, a lovely review. This sounds really good and I have love Tudor novels, though I haven't read many about Henry VII. I really want to check this one out. This book sounds intensely fascinating to me, and I would love to read it. I love it when historical books go in depth into certain situations and professions. That always intrigues me. I read a book similar to this one last year, but this one sounds way better! I think I'm the only one who didn't get swept up in the Tudor craze, so I haven't read many novels in that era. This one sounds divine, and easy to ingest historical intrigue sounds about perfect right mow! You're right. The candle-maker angle makes this one sound really intriguing!